Not very stylish, but look at all of that space! Subaru cabins have never been what you’d call “opulent”. Sure, the use of higher quality materials has become a bit more widespread in more recent models, and you can be confident in the interior staying in one piece throughout your ownership period, but that doesn’t counteract the inherent cheapness of the interior in comparison with similarly-priced cars. The hard, scratchy plastics that smother a vase swathe of the dashboard and center console, for instance, aren’t especially appealing (especially when you consider the higher-spec Subaru Foresters can retail for more than $30,000), and the overall design of it isn’t, to our eyes at least, that brilliant either. Plus, the cabin itself is very, very grey – so, unless you’re colorblind, you’ll probably find the Subaru Forester’s interior to be a rather dull place to spend long periods of time in. Having essentially a cube on wheels at your disposal means the trunk’s pretty commodious. You won’t be uncomfortable in the Subaru Forester, mind. The front seats are especially comfy, with a good amount of side bolstering and lumbar support, and there’s just about enough width in the rear row for accommodate three adults on your average car journey. It’s also worth pointing out that, thanks to the boxy proportions of the car, the Subaru Forester also boasts an impressive amount of leg and head room. Having essentially a cube on wheels at your disposal means the trunk’s pretty commodious, too. A combination of a wide opening, a floor that’s flush with the bottom sill and a capacity of 34.4 cubic feet, the Subaru Forester has more than enough space to swallow up the larger trinkets that make up day-to-day family life. Should you need some more space, however, you can fold the 60:40- split rear seat backs down completely flat – and, as they can be released through pull switches on the trunk sides, you don’t need to wander to and fro the back of the car and the rear door openings. We’re especially impressed with the body control. Yes, we’re fully aware that the kind of person who buys a Subaru Forester doesn’t really care much about handling dynamics. If the PR and marketing spiel are anything to go by, the car’s been designed as a best of both worlds kind of crossover that can tackle the mucky stuff as adeptly it can deal with asphalt surfaces, so it was never going to rival the likes of the Mazda CX-5 or a BMW X4 in terms of behind-the-wheel engagement. As such, we won’t be too harsh on the overly light steering and the wind whistle at highway cruising speeds - especially when you factor in the many other areas where the Subaru Forester actually does a pretty good job at being an everyday car. We’re especially impressed with the body control. Even though it’s riding on tall suspension and has a suspiciously high center of gravity, the Subaru Forester manages to control its body lean through the corners incredibly well. Yes, there’s a fair bit of it, and you’ll especially notice the body roll if you chuck the car into corners as if it were a Porsche Macan, but such issues shouldn’t crop up when driving the Subaru Forester in normal circumstances. The huge windshield and windows give you an incredibly clear view out front and back. Furthermore, the Subaru Forester’s admirably-controlled body lean hasn’t come at the expense of ride quality. On the contrary, the Forester flows along the asphalt rather smoothly (albeit not as well as, say, a Volvo XC60); ironing out most of the harsher imperfections in the road surface. Plus, those who regularly take their Subaru Foresters off-road will be pleased to know that the car doesn’t lurch about violently over rougher terrain – though we will concede that, if you want to be as comfortable as possible whilst tackling whatever Mother Nature can throw at you, a Jeep Grand Cherokee or Land Rover Discover Sport will be the more preferable option for you. Still, at least the Subaru Forester can’t be faulted for being hard to drive in everyday circumstances. That light steering we mentioned earlier does at least come with the trade-off of making the car easy to position on the road. The standard-fit all-wheel drive system also means the Subaru has good traction when pulling away from junctions and satisfactory lateral grip when going around higher-speed sweeping bends. Perhaps most impressive of all, however, is the visibility. The huge windshield and windows give you an incredibly clear view out front and back, and the raked-back front pillars means there isn’t too much of a blind spot to deal with when navigating built-up areas. Having a less upright windshield also means refinement levels are surprisingly good for such a boxy car, with only the aforementioned wind whistle around the wing mirrors and the tire roar at highway speeds having a negative impact on the Subaru Forester’s abilities as a highway cruiser. Subaru’s long been a devout supporter of the horizontally-opposed ‘Boxer’ engine. Subaru’s long been a devout supporter of the horizontally-opposed ‘Boxer’ engine – only a handful of Subarus built between 1966 and now have been powered by an engine that isn’t ‘flat’. Given it’s been making engines like this for so long, then, you won’t be surprised to hear that neither of the two Boxers on offer in the Forester range are internal combustion duds. Regardless of whether you go for the base 2.5-liter or turbocharged 2.0-liter engine, you’ll have yourself a motor that’s smooth, with a very linear power delivery and, in the turbocharged model at least, a good slug of torque across the mid-range that’s especially useful when overtaking on highways. They’re also pretty refined, too, and the turbocharged engine in particular does have the very faint whiff of the racy WRX STi performance car when worked hard (not that we’d encourage you to treat the Forester like a sports sedan on a regular basis, mind...). The Subaru Forester compares favourably with a comparably-specified Mazda CX-5’s 24/30mpg. Fuel economy-wise, the Subaru Forester does fare fairly well – with claims of a city mpg of 24 and a highway mpg of 32 for the most efficient powertrain in the range (the 2.5-liter with the automatic transmission), the Subaru Forester compares favourably with a comparably-specified Mazda CX-5’s 24/30mpg. However, though not terrible, the less efficient Forester models do marginally fall short of what rivals like the Kia Sportage and Hyundai Tucson can manage, with the least frugal Subaru’s claimed 22/29mpg economy figures putting it at about average for a crossover of this ilk. Thankfully, the transmissions are much easier to live with – the manual transmission that’s standard on the 2.5-liter engine, for instance, is pleasant to use and a bit more refined than the automatic. However, sticking with the manual does mean you’ll have to make do with those so-so fuel economy figures we mentioned earlier, so we’re more inclined to recommend the automatic transmission if your budget stretches that far. On top of being more fuel efficient, the ‘Lineartronic’ automatic is also fairly well behaved when left to its own devices. Granted, it can sound a bit strained when you work it hard and does tend to hang onto its ‘gears’ for a tad too long before changing up (as it’s a continuously variable transmission, or CVT for short, it doesn’t actually have any proper gears like the manual has), but it’s otherwise an unintrusive system that suits the car’s character rather well. Plus, if you go for the 2.0-liter model, you get shifter paddles behind the steering wheel, allowing you to simulate a more conventional automatic with six or eight-speeds (depending on which driving mode you engage) and thus solving the ‘holding onto its gear’ criticism. Our recommendation if you’re sticking with the 2.5-liter engine, though, we’re more inclined to recommend the ‘Premium’ trim. In terms of value for money, the Subaru Forester does look like a tempting prospect. Yes, your money won’t get you the most exciting interior in the world, but that cabin on the entry-level models does at least get sprinkled with cruise control, air conditioning, a reversing camera display, front and side airbags and a 6.2-inch multimedia interface that, whilst still a bit clunky at times, is a far more intuitive and slick system than the touchscreen that debuted on the original incarnation of the fourth-generation Subaru Forester. Not bad, considering the range starts out at $23,245. Our recommendation if you’re sticking with the 2.5-liter engine, though, we’re more inclined to recommend the ‘Premium’ trim. It will cost you $2,000 more, but you do get a full-length moonroof, power adjustment on the driver’s seat, alloy wheels and a larger 7inch version of the same display unit in the standard trim. Plus, such an expense still keeps the Subaru Forester’s price at a competitive level that’s on par with what you’d pay for a like-for-like Honda CR-V or Toyota RAV4. Sticking with Premium trim upwards also gets you access to Subaru’s very clever EyeSight system, which bolts on an impressive array of safety gear. On top of applying the brakes if the system’s two forward-facing cameras detect an imminent forward collision, the EyeSight feature also adds equipment such as lane departure warning and adaptive cruise control. It’s not cheap at $1,295, and it does have the proviso of needing you to spend another $1,000 on the Lineartronic transmission, but we feel it’s definitely worth considering if your budget can accommodate such optional extras. 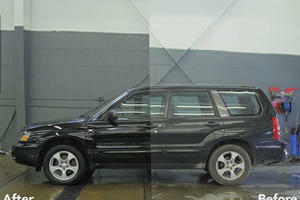 No matter which Subaru Forester you spend your hard earned money on, though, you’re getting a very safe car. We would, however, advise against the 2.0-liter turbocharged engine unless you’re comfortable with spending $30,000+ on a Subaru Forester. Yes, we do feel it’s objectively the better of the two engines available in the range, but it’s a lot of money for a car that doesn’t come with goodies like leather upholstery and climate control (features that, we hasten to add, are standard on the similarly-priced 2.5-liter Subaru Forester models in the top-spec Touring trim). 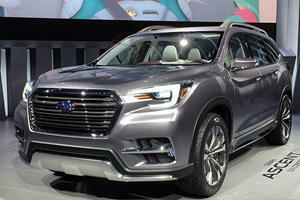 Plus, the 2.0-liter engine can’t be fitted with the EyeSight system – meaning, if you crave turbocharged power from your Subaru Forester and want access to the safety feature, you’ll need to go for the $34,695 2.0-liter Touring model (by which point, you starting to encroach into entry-level Land Rover Discover Sport and Audi Q5 territory). No matter which Subaru Forester you spend your hard earned money on, though, you’re getting a very safe car. 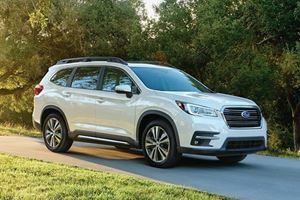 In its most recent test, the 2016 model year Subaru Forester scored the full five stars, with exceptionally good results in the side impact category. Plus, the Subaru Forester has a long history of being a mechanically sturdy car, so reliability shouldn’t be an issue for Forester owners, and strong (if not class-leading) residuals means you’ll get back a fair bit of the money you paid for the car come resale time. 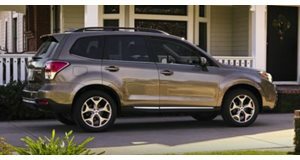 As we alluded to earlier, the Subaru Forester isn’t the crossover for you if you place an emphasis on smart styling and a premium feel inside and out. No matter how hard you look, you won’t find it in the more affordable Forester variants on offer – and the price of the higher spec models that do come well trimmed means you’re better off just sticking with one of the higher-end offerings in this market. For everyone else, though, the Subaru Forester does have lots of appealing attributes. Only in terms of fuel economy does the car let itself down – everywhere else, and especially in terms of practicality, the Subaru Forester does a stellar job of covering as many bases as possible that us normal folk care about when buying a new car. Is it the outright best car in this class? No – the Honda CR-V, Toyota RAV4 and Mazda CX-5 are all, we reckon, objectively better crossovers at this price point. But you’d be doing yourself a huge disservice if you feel those small advantages those cars have are worth discounting the Subaru Forester entirely. Subaru finally has a three-row SUV to sell in the US.